- Sale of merchandise increased by 0.2% to R75.8 billion. - Trading profit decreased by 19.0% to R3.3 billion. - EBITDA decreased by 12.2% to R4.7 billion. - Diluted headline earnings per share of 398.5 cents, down by 24.1%. - Dividend per share of 156 cents declared (2017: 205 cents). 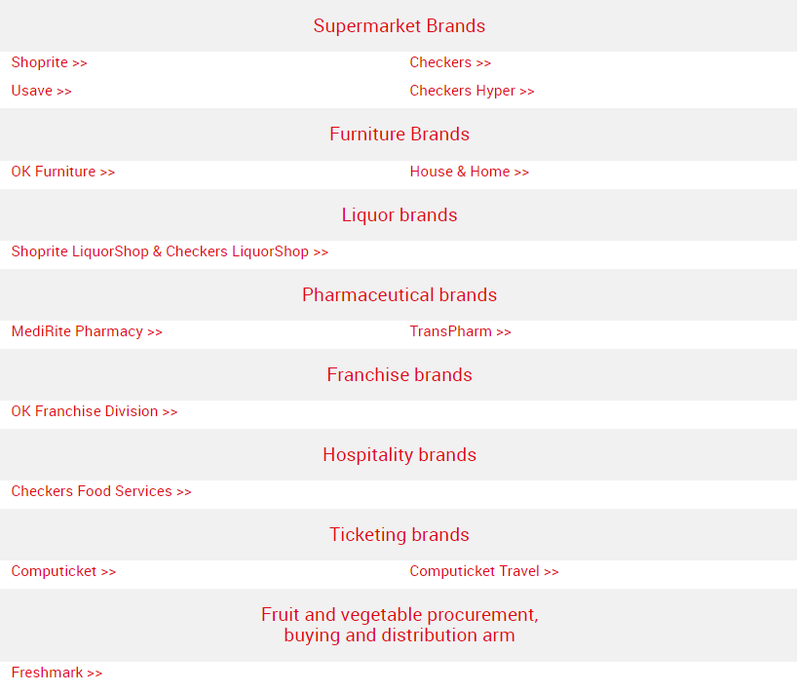 - Opened a net 86 corporate stores during the 12 months (2017: 121). ​ - Created 1 758 additional jobs during the six months. 2018 has been a transformational year for the Group, which remains Africa's largest and most profitable retailer. Our first half performance is below expectations, but not a reflection of the fundamental strength of the business. The results for the six months were affected by an overlapping of multiple factors disrupting the trading environment. These include factors in our external operating environment, where economic conditions have left our core customer under significant financial pressure and in which significant currency devaluations severely impacted the performance in the Non-RSA operations. At the same time, we have dealt with many internal challenges, investment expenses and operational issues relating to the implementation of strategic decisions including the roll out of the new SAP ERP system. The IT replatforming was an absolute imperative and represents the culmination of four years of planning, and it will ultimately improve our global competitiveness. The dramatic devaluation in the Angola kwanza by 85.1% against the dollar since January 2018. The supply chain disruption caused by the Centurion Distribution Centre (DC) industrial action in May and June which lasted longer than anticipated. Supply issues coincided with more than half of the business going live on the IT system in the six months and adversely impacted product availability for customers. ​ RSA internal inflation remains low at only 0.4% marking the longest period of stagnant inflation in a decade. In December customers still benefitted from 10 719 items in selling price deflation. Other environmental issues also affected demand from price-sensitive customers, namely: the listeriosis crisis affecting processed meat sales, SA's first VAT hike in 25 years and the new Sugar Tax. Product availability has improved but a lot of work still needs to be done and remains our number one priority in the short term. We have continued to invest in the business through the cycle in new store rollouts and the digital transformation of the Group. Despite the tougher set of results, we served a record number of customers and sold record product volumes, up 1.7% and 0.2% respectively, whilst supermarket space growth was 1.9%. Strategic decisions to invest in convenience foods, our fresh offer, private label and our liquor footprint also continue to bear fruit. The positive sales trend emerging in the festive season has continued in January and February alongside improving product availability. The South African supermarket operations continued to serve more customers, growing transactions by 2%, while we also sold 0.7% more items. In December, a total of 10 719 items were selling at lower prices than a year prior, although lower than the 11 607 items in deflation at the end of September. This eased the burden on customers as we remained committed to our low price promise, but curtailed organic topline growth in the Shoprite and Usave operations in particular. The Group's strategy to capture a greater proportion of the top-end affluent consumer segments' grocery expenditure has seen Checkers, excluding the larger format Hyper stores, increase sales by 4.3%. The opening and conversion of Checkers stores to our new FreshX concept currently stands at 20 and the focus remains to transform a third of our Checkers store portfolio to this format. Coupled with continuous innovation and improvement in fresh, health and convenience food ranges, we are optimistic about the further value we can extract out of this segment in the medium term. 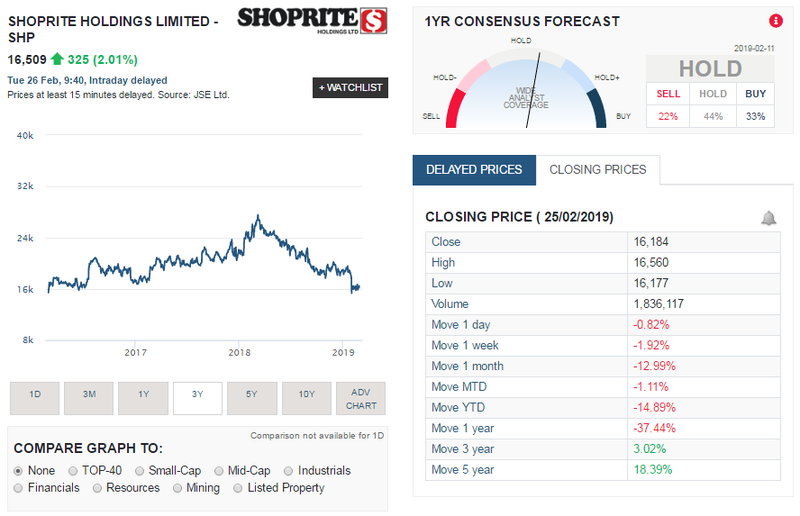 So what exactly are Shoprite (SHP) shares worth? They are trading at a relatively high PE ratio already, they dont pay the greatest dividend, they have very thin net profit margins. So why buy them? Well they have the biggest footprint in Africa and is the largest retailer on the continent, they generated strong amounts of cash each year, they have a large amount of cash on their balance sheet (around 9% of its share price is made up in cash). They have relative success with upgrading and targeting higher end clientele with their newly refurbished stores, which should bode well for their future profit margins and due to their sheer size and scale they would be able to negotiate the best rates with any of their suppliers which should bode well for sustaining their margins (all be it being very low margins). All things considered we value SHP shares at R170.79 a share. So it is trading very close to our estimate of fair value of the largest retailers in Africa.